<< Click here to download file showing more details & Pal Pauer interview. “A NEW PERSPECTIVE ON SOURCE OF THE POST-NAPA QUAKE WATER"
During a recent interview, Pal Pauer, a respected American hydrologist, stated that this post-earthquake release is an excellent example of “primary water”, which comes not from rain-fed, shallow aquifers, but rather from very deep sources, far below typical aquifer levels. Primary water sources are independent of rainfall, and appear to be virtually unlimited. 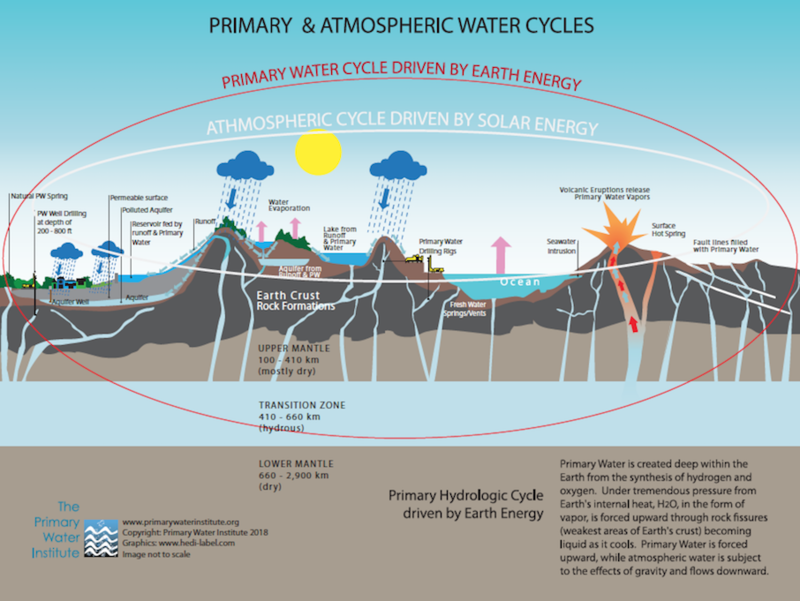 Although the science of primary water is not widely known, there is much evidence to support its existence. Although primary water originates from geological processes deep within the earth, Pauer said it can be tapped (and has been tapped) for use at or near the surface of the earth. This is because primary water naturally pushes up through fracture zones in the earth’s crust, as illustrated in the diagram above. High pressures in the earth’s mantle make this upward movement of primary water possible and inevitable. It is not necessary to drill hundreds of miles deep in order to [ ]access this abundant [and valuable] resource. In some cases, primary water can be found at the surface of the earth, as demonstrated by many natural springs. Primary water can also be accessed by drilling near the surface (less than 200 feet). In other cases, earthquakes, such as the recent one in Napa, can remove blockages and open channels for primary water. This can facilitate sudden release of this great gift from below. Pauer points out that there are other indications that the new-found water in Solano County is, indeed, primary water. For example, there were no major reports of sinkholes or subsidence associated with the release. If this massive volume of water had been released from a shallow aquifer an equivalent volume of water would have had to replace the volume withdrawn so rapidly (over 1,000 gallons/minute, which is over 10 times the pre-quake flow). Otherwise, massive sinkholes/subsidence would have appeared. The lack of sinkholes or subsidence indicates that the source of these new waters must not be shallow aquifers, but must be primary in origin, from much deeper, prolific sources. These primary water sources, in fact, were so prolific, they were able to sustain surface stability even as massive volumes of water were released. In situations such as this, as depleted aquifers are replenished by primary water, variations in flow may be expected until equilibrium is reached. After many decades of successful primary water studies and drilling projects, Pauer has proven that we can ACCESS this abundant source and supplement our current water supply. Primary water may be tapped directly, or may be found commingled with secondary water (e.g. aquifers) fed from atmospheric sources above. As more people become aware of this little-known science, perhaps the Napa earthquake will be remembered for helping us look "down" instead of "up" for solutions to our current, epic drought crisis. A recent study documented the presence of vast quantities of water locked far beneath the earth’s surface. That study confirmed "that there is a very, very large amount of water that's trapped in a really distinct layer in the deep Earth… approaching the sort of mass of water that's present in all the world's ocean"